All eyes remain on the status of the “migrant caravan” near the U.S. border and the federal government’s treatment of these folks. The nearly 7,000 person caravan originated in San Pedro Sula, Honduras on October 13th. There has been a great deal of speculation on what the “migrant caravan” is and why people are traveling in a “caravan”. The majority of the people are from Central America and are fleeing violence and crime in their home countries. The group includes many families including some with young children. 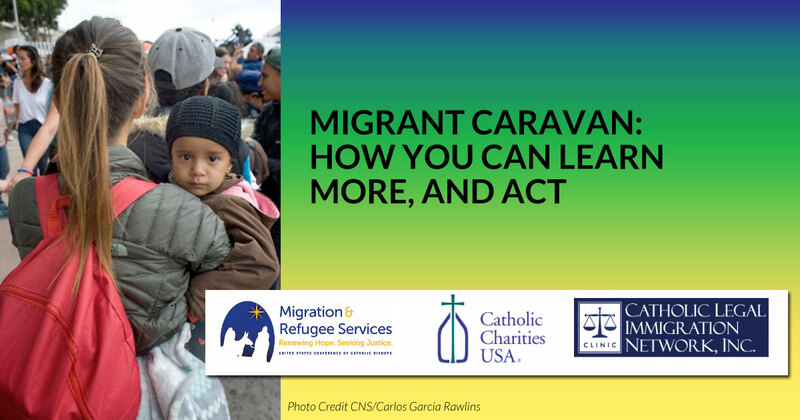 Catholic Charities USA, Migration and Refugee Services, and Catholic Legal Immigration Network have assembled a backgrounder to help the public learn more and take action. You can access the English version by clicking here and the Spanish version by clicking here. Welcoming migrants, immigrants to the United States is part of our ministry as Catholic Christians. There is room for everyone who wants a better life for themselves and their family in our great country. Americans should share their economic and privileged status with others who must move away from violence and starvation.